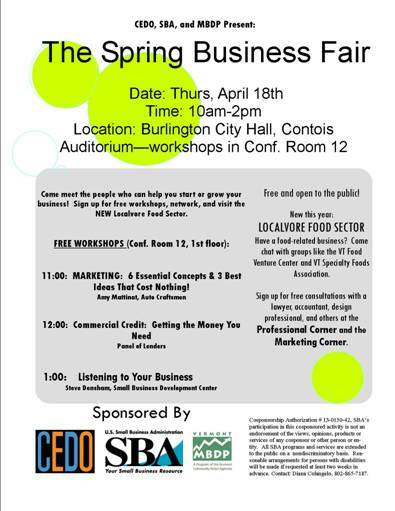 #BTV #VT – Please join us at the 2013 Spring Business Fair – Thursday, April 18, from 10am to 2pm at Burlington ’s City Hall. The event connects people interested in starting or expanding their business with a variety of federal, state and local organizations and businesses that can help. Professional corners- speak to legal, accounting, insurance and marketing experts for free! Bring your business questions! NEW THIS YEAR! Visit the Localvore Food Sector of the event and connect with food business development organizations. Interested in creating a food product or starting or expanding a food truck, food cart, restaurant, CSA, catering business, etc? Do you have a family recipe that you think would make a great product? Want to know more about packaging, nutritional labels and regulations? Want to get your product into stores like City Market? Connect with food experts to help you learn more!